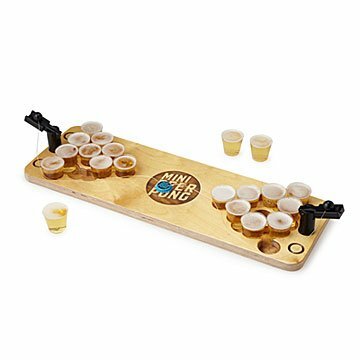 A dorm room classic grows up in this mini version of beer pong that sports catapults and a birch wood base. Whether you were demanding a re-rack or blowing a spinner right out of the cup, your reputation amongst the beer pong circles is just about as storied as the ubiquitous red cups that led you to victory. Take your talents to go and swap the watered down 30-rack for a hoppy craft brew with this rustic mini version of a dorm room classic. Beautifully crafted, this wood design differs from your typical game by offering fun launching catapults. A custom cup layout allows for strategic re-racks, while a magnetic bottle cap in the center keeps the balls tethered in place. Another elevated addition? Smaller cups allow for a more grown up beer palette. Let the games begin! Handmade in Minneapolis. Step into Derek & Sam's Minneapolis workshop and check out some of their niftiest prototypes on the blog. It all started at a bar. Fraternity brothers Derek “Ducky” Dahl and Sam were procrastinating studying for finals when they noticed some board games on a shelf and thought, “What if we could make beer pong into a board game?" But alas, the boys had neither the money nor the skills to make it happen. One day, they happened upon a community makerspace where they could gain affordable access to and training on all the tools they needed to turn their idea into a reality. Many prototypes later, Mini Beer Pong was born. At first, the duo were assembling their games 1) afterhours, 2) in a corner of an unheated garage, 3) in the dead of winter, 4) in Minneapolis. With no prior sales experience, they tried to figure out how to get their game out to the world. But gradually, their game started appearing at more and more happy hours around the country, and their business slowly started to take off. It is great having a miniaturized version of such a fun, group game. The cost may be daunting for some, but this pong set is really well made and even includes little cups to go with it. Both of my grown kids LOVED this product! This gift was a complete surprise to both of my grown kids, and they could not have been more excited! I always rely on this website to find the perfect, unique gift! Doesn't work that well. The product didn't come with any instructions on how to play the game. It really just isn't that fun. We were so excited to set it up for our BBQ. We left it in the box until we could enjoy the use. Unfortunately, we didn't get correct parts in the package to build the balls and couldn't play the game. Hoping next week we can get ahold of the manufacturer to help us so we can enjoy the game. For the couple who doesn't have the space for beer pong, yet would still love to play the game! We had so much fun bringing this game to the party. We laughed throughout playing the game. I got this for my husband and I to play together as a throw back gift. We used to play beer pong all the time but it's messy and sloppy. Enter MBP! Seriously so much fun. Love that the little balls are attached so they don't get lost. My only complaint is that the picture showed little red solo cups when I placed my order and it came with clear cups. The picture has since been changed and it's not a deal breaker but I would have preferred the red cups!